The boys both earn an allowance by good school work, and chores, with an option for some extra for extra chores and/or maths. He started his lessons this week and is thrilled that his is already learning 'songs' (Peter Gunn and Brain Stew apparently). 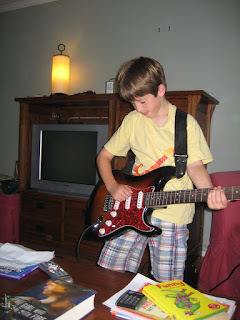 He came back from his first lesson and played what he learnt. The following day we bought his headphones for the amp! Stuff has been happening on the house, although not much of it is visible (and do you really want to see our nice new sewer after all?). 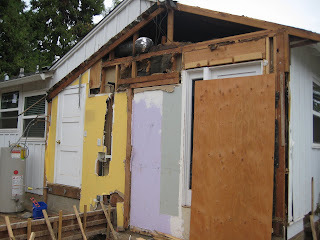 We just had the under-floor inspection so the next step is insulation and subfloor going down. 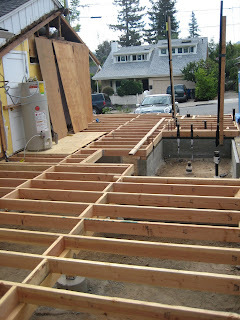 Then the framing of the walls starts and the house will really start to take shape. The boys both went to a popcorn fundraiser outside Lunardis on Sunday so both were duly shined and polished. Adam has graduated to be a Bear Cub this year and was keen to show his little brother the ropes. 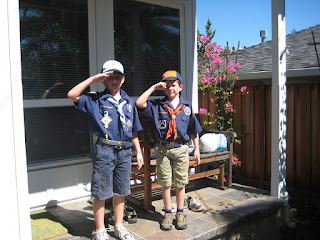 Here they are demonstrating the cub scout salute. 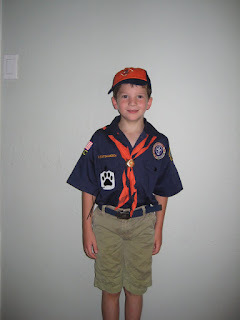 *Do Your best - but cubs and scouts in the USA don't appear to say this. 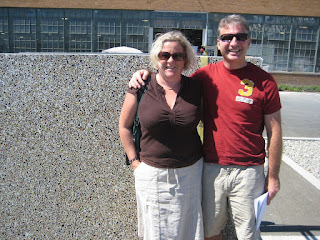 On Friday Nigel and I took a trip to Point Richmond to chose our new kitchen countertop. You might ask why we went 1.5 hours away just to get a counter - but I have to say it was more fun than I expected chosing a counter to be. 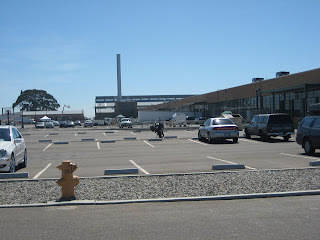 We went to a factory sale at Vetrazzo which is located in the old Ford plant. This factory was built in 1931 for the Ford model A production line. It's a quarter of a mile long, and with north-facing skylights is naturally lit for most of the time. The old building was rescued and restored and is now the home of several 'green' companies. 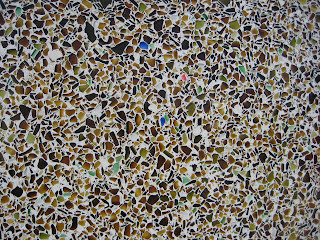 Close up you can see that this particular slab (which was an experimental variation of alehouse amber - hence it's inclusion in the sale) also has green, blue, and some red glass. Check back some time in December* to see the finished counter in our kitchen. 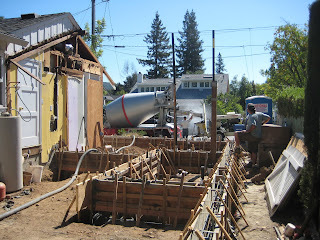 I was astonished that we had 3 concrete mixers full of concrete in this relatively small extension, and that the activity was so frenetic. The concrete supplier told us that 2 years ago he was doing 2-3 projects a day, now he is pleased to get one a week! 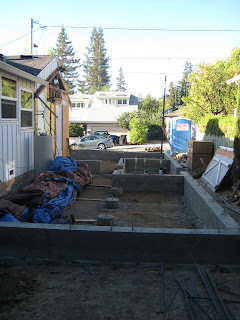 The contractor was filling the footings with thicker concrete, then adjusted the mix for more runny concrete to fill the forms. Runnier concrete goes around the re-bar easier, with fewer airpockets, and leaves a smoother finish on the exposed part of the foundation. The tall pipes in the foreground are the vents for the new plumbing in the utility room, the plumber was using the pipes to test for leaks before the plumbing gets encased in the concrete floor! Yesterday the forms came off and we have foundations! You can really feel what the new layout will be like, and we walked around the 'rooms' last night fantasizing about how we will furnish them! Monday should see the lumber delivery - so we move into a new phase of construction. So, the boys are going to be Harry Potter and Ron Weasely at Halloween. Adam will be Ron, Fin will be Harry. We have already made the robes, and with help from Nana assembled the rest of the costumes. (She sent school shirts and ties from the Liphook and Southampton charity shops - thanks Mammie!). It's usually pretty warm in October here, but sometimes Halloween can be cold, so I decided that as a knitter, the least I could do was to produce some Mollie Weasely Sweaters. Im using the pattern from Charmed Knits which I got from the library. 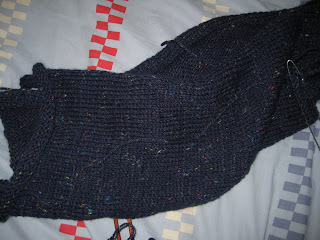 I'm using Webs' Williamstown in Navy for the Harry sweater, and Merlot for Ron's sweater. The yarn is a wool/acrylic mix and feels nice and soft. I'm planning to add the initials with duplicate stitch (swiss darning). Saturday saw the start of the soccer season. 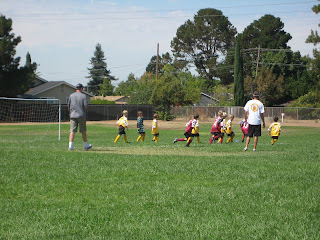 Both boys are in a league this year and played their first ever games last weekend. In Finlay's age group the coaches also run about on the field shouting instructions...eg "Kick it towards the goal" and "spread out". Fin* is in the middle of this shot in the maroon, playing for the Iguanas in jersey number 5. * Finlay has announced his intention to be known as Fin and has arranged with his teacher and soccer team to call him Fin. I'm waving from what is my kitchen door. The following picture is the playroom and kitchen doors, along with a nice montage of all the colours these rooms have been painted (what were we thinking with that lavender colour?). In other house news, Sunday's rain has created a nice new stain in the dining room, fortunately this part of the ceiling will also get demolished at some stage. 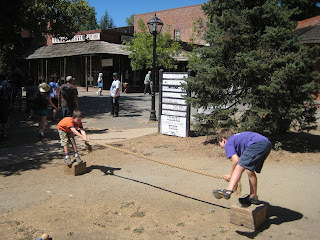 We spent the Labor day weekend in Gold Country. 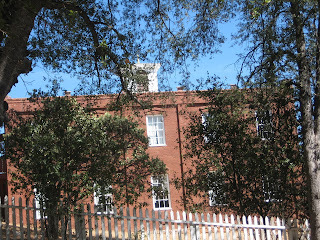 We took the boys to Columbia State historic park which was a great success. Columbia was an early Gold Rush town, and at one point it was one of the largest towns in California with some of the richest gold deposits. A surprising hit was some children's toys that the park rangers had available. 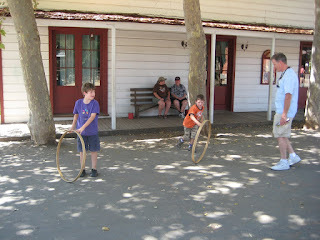 Finlay was a demon with the hoop rushing up and down the street. We visited the school house where they were appalled by the dunce's cap, and we stopped for a sasparilla at the saloon where the major attraction was being able to throw peanut shells on the floor! 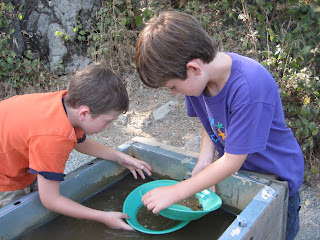 Finally, of course we panned for gold. The boys took this very seriously and were thrilled to be rewarded with some tiny flakes of gold which they bought home. 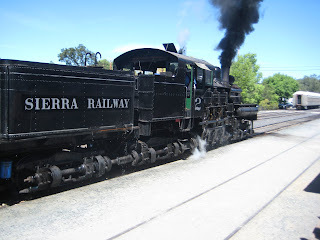 Sunday we visited Railtown 1897 in Jamestown where we rode on one of the steam locomotives. We had a great weekend in Gold Country, staying again in Murphys with the obligatory trip to Nelson's Candy store. 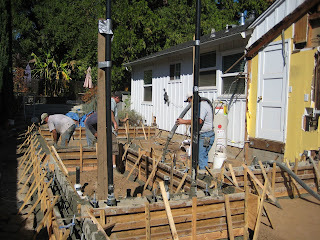 Most of the digging is done and the contractors are beginning to set the forms for the concrete foundations. 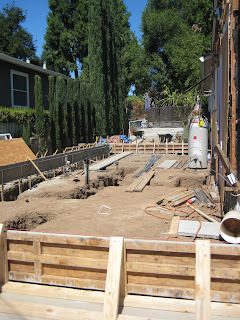 The shape of the extension is beginning to be apparent - the forms here are the perimeter of the new construction. 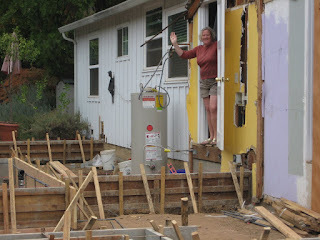 We still have some further foundation work, but that is under the house and will be done when the kitchen is out..something fun to look forward to! Week two of the remodeling project. Today was a lot of digging - I am very grateful that it was not me! 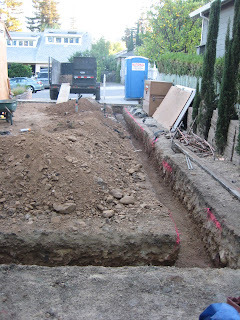 This trench is the beginning of the foundations for the extension. The new foundations are 8" thick.